Gillum, possibly could be Florida’s version of Kwame Kilpatrick, IF we vote him In as Governor! 😡 The best choice for our piece of paradise in the sun is Ron DeSantis! Ron DeSantis is the former U.S. Representative for Florida’s Sixth District and the Republican nominee for Governor of Florida. He was endorsed by President Donald J. Trump. 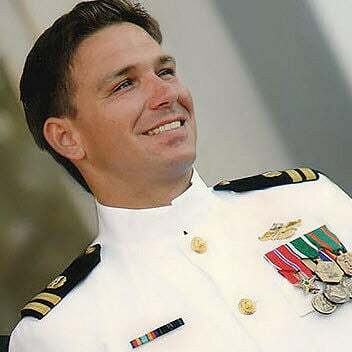 Photo of Ron DeSantis JAG officer. A native Floridian with blue-collar roots, Ron worked his way through Yale University, where he graduated with honors and was the captain of the varsity baseball team. He also graduated with honors from Harvard Law School. While at Harvard, he earned a commission in the U.S. Navy as a JAG officer. During his active-duty service, he supported operations at the terrorist detention center at Guantanamo Bay, Cuba and deployed to Iraq as an adviser to a U.S. Navy SEAL commander in support of the SEAL mission in Fallujah, Ramadi and the rest of Al Anbar province. His military decorations include the Bronze Star Medal for Meritorious Service and the Iraq Campaign Medal. After active-duty service, Ron served as a federal prosecutor, where he targeted and convicted child predators. He still serves in the U.S. Navy Reserve. He was first elected to Congress in 2012, where he fought for term limits, the No Budget/No Pay Act, and to cut taxes. While serving in Congress, Ron refused his Congressional pension and health insurance plan because he is against special deals for politicians. He also sponsored legislation to make it easier for the military to prosecute sexual assault and authored the bill to end the secret taxpayer-funded slush fund for members of Congress to make hush payoffs for sexual harassment. A strong believer in transparency, Ron released his tax returns which are available here. Ron is married to Casey DeSantis, an Emmy Award winning television host. Together, they’re the proud parents of their daughter, Madison, and their son, Mason. So there you have it. Save our State Of Florida from Corruption and a 40% TAX Increase. Say you don’t approve of Crime Corruption and HIGH Taxes by voting for Ron DeSantis!